The Dvarsh language is written with twenty-two characters that function as both consonants and syllabary, depending on context. Each character, standing alone, is also a word in its own right. There are, additionally, six vowel symbols used with the main characters when they function as consonants. The table that follows illustrates the set of characters in calligraphic and typographic versions. Dvarsh characters were inspired by plant forms: leaves, thorns, berries, buds. Written lines may go left to right, right to left, top to bottom, bottom to top, or whatever; one always reads in the direction “the vine grows.” The characters shown are oriented left to right, which is most familiar to typical Anglophones. 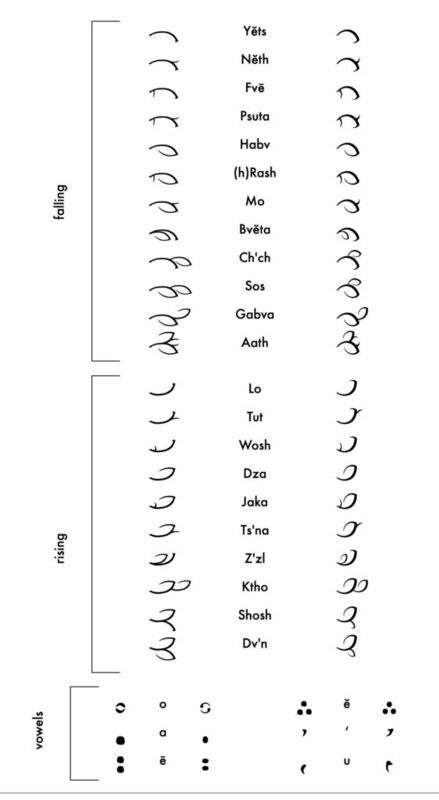 A comparison of calligraphic and typographic versions of Dvarsh characters. The table is taken from Dvarsh, An Introduction, copyright 2017 by Stikmantica.